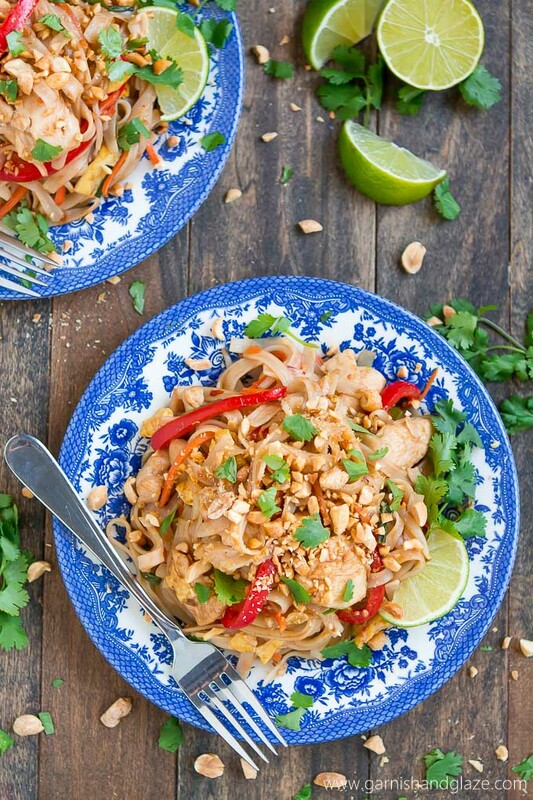 Enjoy Thai food at home with this quick and easy, sweet and spicy Chicken Pad Thai. I enjoying going out to eat because it gives me a break from doing dishes and I get to try new entree‘s (I definitely always sample my husband’s dish!) to try to replicate at home. 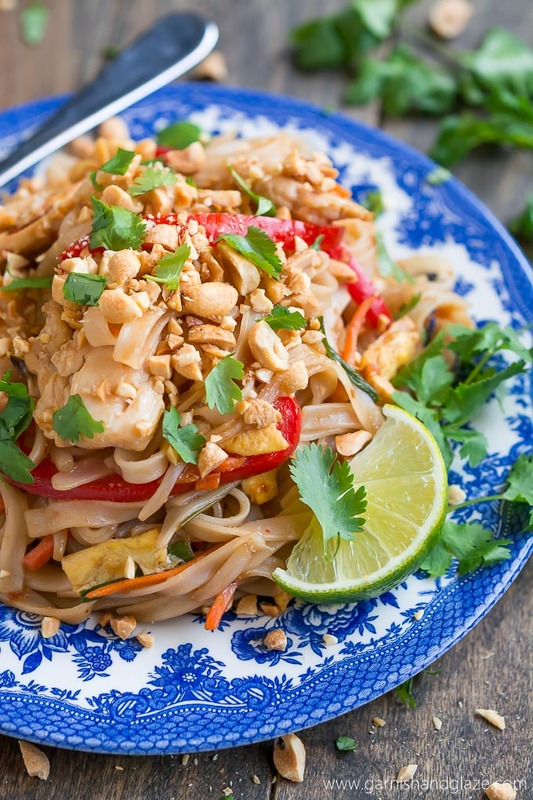 A little over a year ago we discovered a yummy Thai restaurant in Omaha where I had the best Chicken Pad Thai. I knew that making a copycat recipe of it was the only way I as going to be able to eat it as frequently as I wanted and now you can too! As a kid, I don’t remember eating Thai food much but I now eat it at least once a month. On of my favorite dinners is Tikka Masala with homemade Naan. 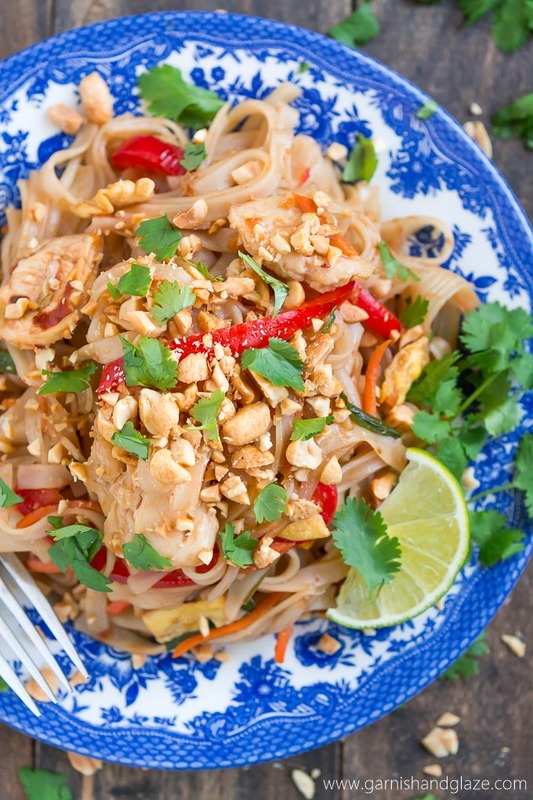 Pork Pad Thai, Thai Chicken Peanut Noodles, and now this Chicken Pad Thai follow close behind. This tastes pretty dang close to the restaurant’s version with the addition of a few veggies (peppers and carrots) to make it a little healthier and more of a complete meal without having to make a side dish. I think I like it so much because it’s sweet, savory, and spicy all at the same time. I also like how quickly I can throw it together. Oh, and it’s got my favorite herb– cilantro! It adds a pop of color but its refreshing flavor compliments the spicy sauce (the heat can be adjusted though if it’s not your thang). I have so many Thai recipes coming your way. Be excited!!! And if you haven’t tried Thai food, start NOW! Meanwhile, heat oil in a large non-stick skillet over medium-high heat and cook chicken for 4-6 minutes until done. Remove from pan and set aside. Add the eggs and scramble until done and then remove from pan. Saute the bell pepper 1-2 minutes and then add the bean sprouts, carrots, green onion, and garlic. Cook for 1-2 more minutes. Add the noodles along with the chicken, eggs, and sauce and cook 1 more minute. Serve garnished with cilantro and peanuts. This recipe first appeared over at Penney Lane where I’m a contributor. 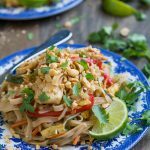 This pad thai looks so delicious- I love making restaurant/takeout favorites at home! OMG! Melanie,today is father’s day and I cooked this dish. Did it come out perfect? YES!! My husband had a second round. Thanj you so much for sharing the recipe. It has already been passed forward to my South African Zulu family. I KNOW they will enjoy it. How does this meal do as a reheat meal? Have you ever had enough for a leftover meal? 😊 We like to do most our prep on the weekends. It does fine. I don’t think any noodle dish is as good as the first day. The sauce thickens making it seem a little dry but if you add a little chicken broth when reheating it will thin out. Whenever I make pasta and know there will be leftovers I try to reserve some of the starchy cooking water to mix in with it to prevent the sauce from getting too thick and dry.